Overwatch fans have uncovered new voice lines for Mercy and Genji for Valentine’s Day in the Public Testing Region’s latest patch. The two characters share some chocolates, which seems innocuous. You might assume that more information about these characters would be a boon for ‘shippers—people who write fanfic and make art about the characters in romantic relationships. But these lines have launched ‘ship to ‘ship combat in the game’s fandom, revealing how delicate the world they’ve built really is. The lines themselves seem pretty inconsequential. Mercy and Genji share chocolates on Valentine’s Day, and she makes a pretty weird, kind of rude comment about them not being Swiss. He bought you chocolates, girl, chill out! You can hear the lines below. While some fans don’t like the idea of the characters being canonically straight, there are other concerns that go beyond preference for a particular ‘ship. 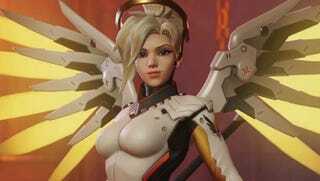 Some fans believe that ‘shipping Mercy and Genji is inappropriate because Mercy is the Overwatch foundation’s doctor. For them, the conflict of interest in a doctor/patient relationship is enough to make the ship feel inappropriate. There’s also been the implication by fans that Mercy was the one who gave Genji his robot body. Mercy rebuilding Genji isn’t explicitly present in the canon of Overwatch, but because the game’s canon is scattered across voice lines and motion comics, fan theories take root and stay there. According to the Overwatch website, it is true that Mercy was the one who saved Genji’s life, and it is also true that Genji at some point left Overwatch and hung out with Zenyatta to make peace with who he was. That might be enough to justify the theory for you, and therefore some fans see the relationship as predatory on Mercy’s part. Gency ‘shippers and other fans who aren’t as heavily invested in ‘shipping have already responded to the negativity by pointing out that this reaction seems overblown. Not only do these voicelines not really confirm anything, it isn’t as if being attracted to a person of the opposite gender makes the characters straight, which means other ‘ships could still stand. Additionally, given how little information about the characters exist, fans can bend the sparse facts into a reason why any ‘ship is unethical or predatory. If Mercy is the Overwatch foundation’s general practitioner, then should she be dating anyone in Overwatch at all? Ship wars are as old as Star Trek, so this reaction isn’t surprising. Back in the days of Livejournal, the bloodbath over Harry/Hermione vs. Ron/Hermione included essay length posts about hippogryphs and impersonations and undercover infiltrations of rival message boards. The only difference between Overwatch and those fandoms is the way that information is disseminated and just how little information there is at all. Unlike fandoms built around television shows, movies, or narrative-based games, Overwatch has extremely little in the way of a canon. It’s hard to say how the characters know each other, if at all, or what their relationships are to each other. For a lot of players this is no problem; they’re here for a class based shooter. But for people in the fandom, every little nugget of information dropped down from Blizzard is an opportunity for a theory to get confirmed or debunked. This is part of why Tracer being revealed as gay was such a big deal. Many fans were already reading her (and other characters) as queer, but to actually see what precious little canon there is confirm it was refreshing and exciting for those fans. The Overwatch fandom has an inspiring amount of creativity because it needs to make up a lot of the characterization and relationships as they go along, but that also means that their universe is very fragile. New voice lines like these ones can radically alter the fans’ perception of the game—but knowing how creative the Overwatch fandom is, that doesn’t mean they can’t fanfic their way around them.